Real Madrid's Jese Rodriguez is reportedly a target for Arsenal. Tim Sherwood’s future as Aston Villa manager remains uncertain after owner Randy Lerner met senior staff in America last week. Liverpool are growing confident of signing in-demand wonderkid Ruben Neves from Porto after an informal approach was welcomed by the player’s entourage. Manchester City boss Manuel Pellegrini has been warned the club will not tolerate a repeat of last season’s trophy-less campaign. The warning came as City released their annual report, which revealed a bottom line profit of £10.7million ($16.5m), the first since Sheikh Mansour’s 2008 takeover. New Liverpool boss Jurgen Klopp has laid down the law as he gets his hands on the Kop stars. The full squad trained together on Wednesday for the first time since the German’s appointment and he made crystal clear what he will demand of them. Jermain Defoe has been told he is fighting for his Sunderland future by new boss Sam Allardyce. Manuel Pellegrini has been told he must deliver success on the pitch to match the progress mega-rich Manchester City have made off it. 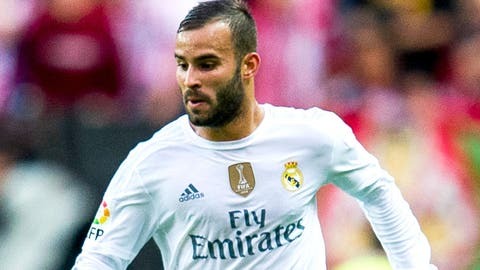 Arsenal have been alerted to the availability of Real Madrid forward Jese Rodriguez, whose future has come under the microscope due to a lack of playing time at the Bernabeu. New Sunderland boss Sam Allardyce is keen on signing QPR striker Charlie Austin in January. PSG are ready to move for Arsenal boss Arsene Wenger if current manager Laurent Blanc fails to win the Champions League this season. Arsenal are reportedly set to steer clear of William Carvalho in January. The Sporting Lisbon midfielder was on the Gunners’ radar in the summer, but after fracturing his leg, Arsene Wenger abandoned his interest. Arsenal striker Alexis Sanchez has told Real Madrid he is happy in north London after being linked with the Spanish giants. Tim Sherwood is under huge pressure after a top Aston Villa chief said they are at a "critical stage of the season". FA chiefs will officially dump their support for Michel Platini today as the FIFA corruption scandal deepens. Gareth Bale revealed it took him "one second" to reject England and choose to play for Wales. The Real Madrid superstar, 26, has an English grandma but rejected an FA approach as a youth. The FA is planning to save £30m ($46.5m) by sacking England manager Roy Hodgson’s backroom team. Victor Valdes’ difficult spell at Manchester Untied is set to end in January, according to his agent.